The next installment of the Dailies:PORTAL Film Exchange Project screens at the Goethe Zentrum at Colony Square in Midtown tonight. New works from Germany, Poland, Russia and Austin, Texas. "DAILIES has had 5 screenings in Berlin and Munich. We always a big crowd and great discussion. We believe in an equal exchange -- our artists showing there and theirs showing here 50/50. DAILIES will have more screenings in 2009. We also have a co-production film project beginning between Atlanta and Berlin. This is a perfect time to join in the discussion. The Goethe Institute funds travel for several filmmakers each year. The discussion after the screenings helps them understand the interest in our filmmakers for working outside Atlanta. Goethe is not just a German Cultural institution, but is a global network with branches in most major cities world wide (5 in America). They support work in each of the hundreds of cities world wide. The hope of the Dailies PORTAL exchange is not to immediately like each others films, but to see if a dialogue is possible. ...is International Animation Day. 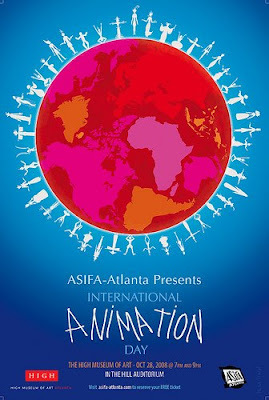 ASIFA - an international animation organization - has chapters all over the world that exchange work and screen it today in celebration of contemporary animated film. If you haven't reserved your free seats, show up to ASIFA-Atlanta's event tonight at the HIGH, and there are likely to be some extra seats. 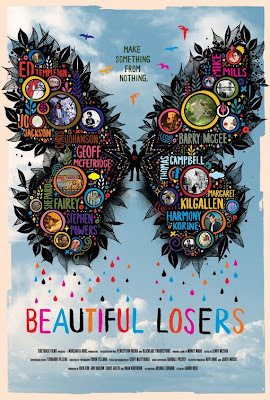 Screenings at 7 and 9pm. 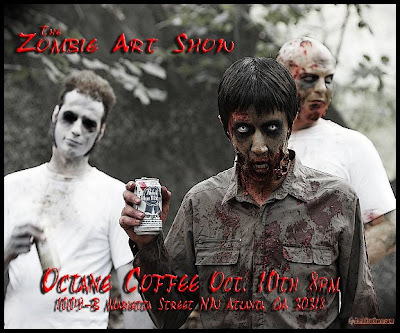 Zombie Art Show, featuring stills from the flick "Necromance" and live zombies. I've been reviewing some history, notes, and functions of this blog, and will be doing some restructuring. In doing this, I realized that some of the on-going film nights and related events have died. That's sad. I'm interested in what people think about these events and any ideas you might have as to why they died off. Also, your feedback throughout the formation and life of this blog has been priceless, and is especially appreciated during this time. Please leave comments and/or email me. After MUNNYbrella, stop by the East Side Lounge in East Atlanta for the HURT Show, curated by Rene Arriagada. Some of our favorite Atlanta artists couldn't participate in the MUNNY Show because they're showing their stuff here. Definitely check it out. Last post. New format coming now. B&W Rap Videos that Make New York Look Super Menacing.